Instead of buying your own 3D printer, you can have Amazon print 3D objects for you for around $30 for most items. We like the idea of a personalized bobble-head doll. 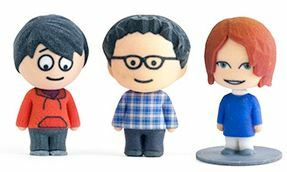 The tiny figures, around three inches high, bobble when you touch their head. We’ve seen these for sports figures, and even race-horse trainers like Bob Baffert. But we’ve never thought of making our own. Unfortunately, you can’t upload a photo to make it really resemble someone. You’re stuck with choosing from a variety of hair styles, eyes, and clothing.